A Higgs boson is an excitation — a fleeting, grainy representation — of the Higgs field, which extends throughout space and gives all other particles their mass. At the instant of the big bang, everything was the same as everything else, a state of symmetry that lasted no time and was immediately broken. Particles of matter called fermions emerged from the sea of energy (mass and energy being interchangeable), including quarks and electrons that would much later form atoms. Along with them came force-carrying particles called bosons to rule how they all were related. All had different masses — sometimes wildly different masses. The very heart of ATLAS is a pixel detector consisting of 80 million tiny silicon rectangles 50 microns (millionths of a meter) wide and 400 microns long, each connected to its own electronics — many millions of transistors bathed in the most intense radiation an accelerator has ever produced. Whatever news comes out of CERN in the wee hours of the morning on July 4, hints and indications so far are just the beginning of the search to pin down the Higgs and learn its characteristics. The Higgs search commences a long voyage of discovery into a realm of unexplored physics, of supersymmetry, dark matter, miniature black holes, extra dimensions of space — and other, unanticipated wonders that defy prediction. 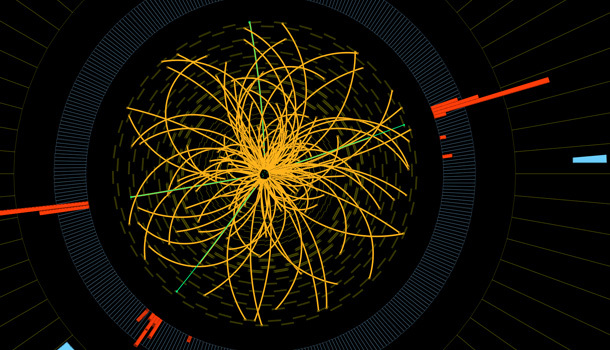 The Higgs Boson: Whose discovery is it?